If you haven’t been paying attention to DreamWorks, you are missing out! DreamWorks Animation Television has stepped up their game. They are bringing stories to life that have amazing character development, in-depth storylines, and amazing animation. 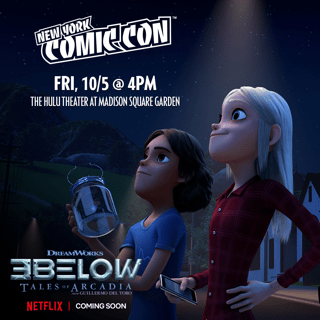 At New York Comic Con (NYCC) they will have panels on DreamWorks Tales of Arcadia: 3Below, DreamWorks Voltron Legendary Defender, and DreamWorks She-Ra and the Princesses of Power. All of these are Netflix original series. You can start off your con on Thursday morning, October 4th, with the DreamWorks Voltron Legendary Defender at Panel 10:30-11:30 AM, at the Hammerstein Ballroom. This is just a short walk from the Javits Center. It should be a fun morning, as the following cast and crew come together to reflect the emotional season seven and give insight into the final chapter, coming to Netflix later this year: Joaquim Dos Santos and Lauren Montgomery (executive producers), Josh Hamilton (editor), Bex Taylor-Klaus, Josh Keaton, Jeremy Shada, and Kimberly Brooks (voice actors) are all scheduled to be present. Then you can stick around for a DreamWorks She-Ra and the Princesses of Power at 3:00-4:00 PM, also at Hammerstein Ballroom. Some of you may remember the popular 80’s series. Well SHe-Ra she is back! Join executive producer Noelle Stevenson (Nimona, Lumberjanes), Aimee Carrero (voice of Adora/She-Ra), and Karen Fukuhara (voice of Glimmer) as they offer the audience a first look at the series. Still looking for more? Drop by their booth #502, where you can experience this imaginative world, which includes a statue of She-Ra and photo ops. This will require a reservation, so keep a close eye on NYCC social channels. On Friday, October 5th at 4 PM, make sure you are at The Hulu Theater at Madison Square Garden. There you will get to take a look at the new, exciting series DreamWorks Tales of Arcadia: 3Below from Oscar winner Guillermo del Toro This is the second installment of Tales of Arcadia; the first installment is the seven time Emmy-winning Trollhunters. The panel will include Guillermo del Toro, executive producers Rodrigo Blaas, Marc Guggenheim and Chad Hammes, and actor Diego Luna.